The file, in excel format, manages 11 months of planning financial corporate. It is simple to use and unique in its kind. It is recommended for the management of the cash flows of the Companies. See also the ONLINE VERSION. To see it please CLICK HERE. The site shows a model to be used for the planning of cash flows of your company. 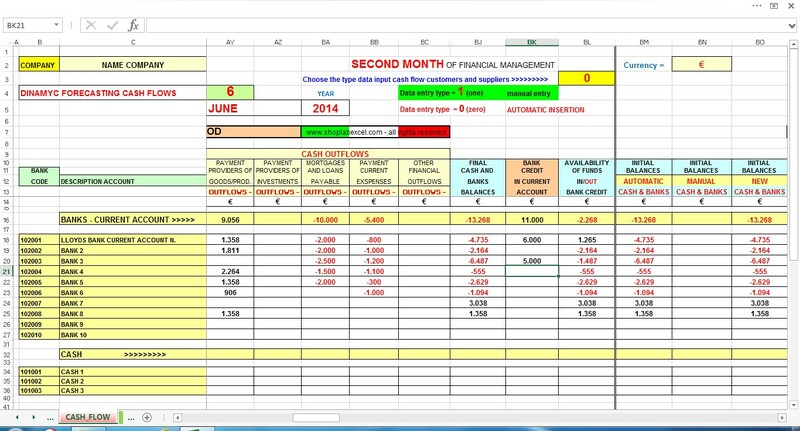 The spreadsheet "The management of cash flows" is designed to effect financial planning up to 11 months. The pictured model is dynamic, flexible and easy to use. The images shown below are only indicative and do not represent, in a comprehensive manner, the entire functioning of the file. The cash flow from customers and suppliers for the first month is handled manually because it is assumed that the company is in possession of accounting data updated of the closing dates of receipts and payments of the first month. Dividend, the financial management of the first month in two parts we have tried to give a more immediate representation of its financial commitments. The financial planning of the second month may ,instead, be managed either automatically or manually. From the third month onwards, the financial planning will only take place automatically. The spreadsheet manages the financial planning also at the turn of the year. The initial cash balances of each period successive of financial management are proposed automatically but can be changed manually by the user. This is the picture of one of the 11 spreadsheets. 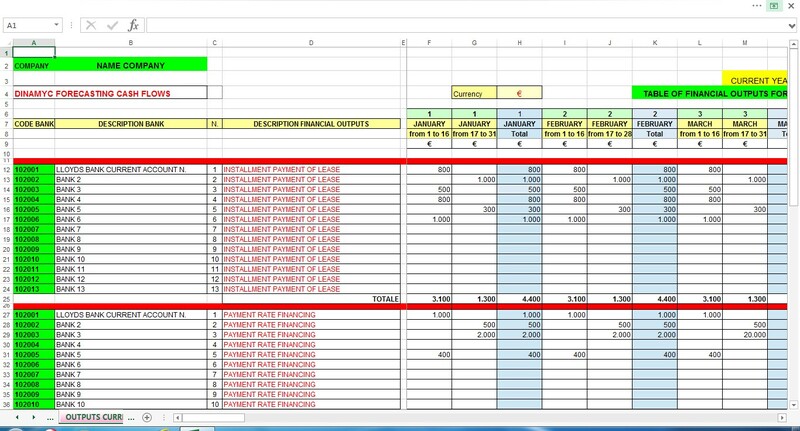 The cash outflows provided in the spreadsheet "Other Outputs" are indicated for each monthly period and may be debited from each of the 13 banks indicated in the spreadsheet. All financial outflows shown in the spreadsheet above indicated will converge, every month, in the cash flow general like represented in the image demo n.1. 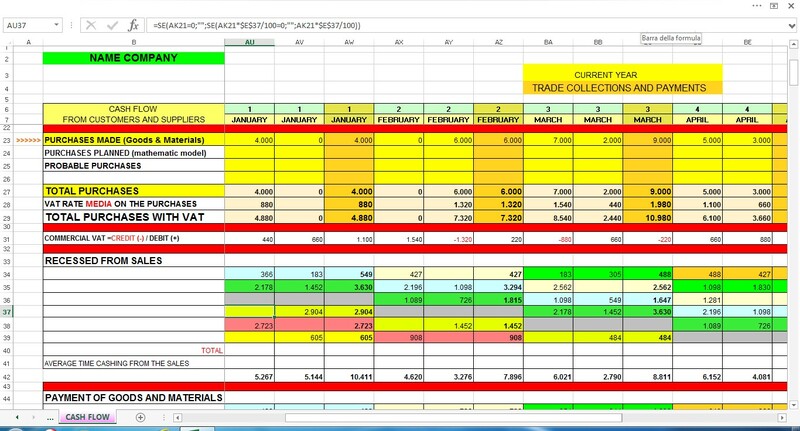 This spreadsheet, as well as all other spreadsheets, provides for the management of financial outflows for the current year (n) and for the following year (n + 1). In another sheet called "Outputs Currents" is exposed, among other things, the dynamic of periodic VAT settlements with evidence of the total debit and of the payment period, taking into account the VAT tax system adopted by the company. This is one of the spreadsheets most important for the management of cash flows. In fact, the proper management of this worksheet will allow the user "Company" obtain, with more precision, an forecast of the receipts and commercial payments of the months following the first one. The mechanism of the calculation of the commercial cash flow is simple although, apparently, seems complex. The user should take care to include in the prospectus the amount of the purchases and of the sales of the previous year and the current year. The amounts of the purchases and of the sales of the previous year must be inserted, obligatorily, each year at the exchange for each accounting year. In the current year, instead, this value must be entered (and saved) month by month, at following the accounting record of the amounts of the sales and of the commercial purchases. Just in case the actual data are not available, the user could to insert in the prospectus the data probable or close to those accounting taking care, however, to replace them as soon as will be in possession of the actual ones. The data probable of the sales and of the purchases, however, shall prevail and will go to overlap to the forecasted data.